Low cost calls with Corporate Dialeron Web as well as through applications for iPhone, Android and BlackBerry handsets. The Blackberry dialer is fully integrated into the Blackberry device. 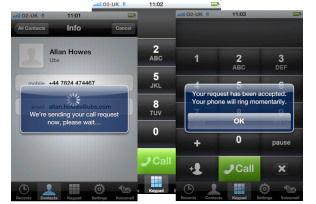 Once installed and configured, users see the options to dial through the dialer from the standard menu, selecting their their preferred mechanism for dialling. Taking into account geo graphical locations. A process of changing dialling mechanism if the preferred means for dialing is not available. The Corporate Dialer supports a number of different options that can either be defined by the enterprise or on a user level. These options are classed as Rules by which the application will place the call. All devices support the available Rules. In Pre-dial, user places a call through the application, which informs the server of the destination number and dials into the enterprise network, which routes the call on to the destination. User pays local leg of the call, whilst the enterprise pays the for the destination leg. The Corporate Dialer can be used out of the box or integrated and branded into custom applications utilising the API. The flexibility enables the solution to meet the requirements of both BYO and corporate handset strategies. The iPhone solution requires calls to be placed through the application itself. Similar to the Blackberry the BYO solution also supports all three mechanisms for dialling. The application syncs with the user’s device contacts and enables them to dial as they would through the native iPhone application. Throughout the dial process the user is notified with information boxes so they know what is going on. As with the Blackberry settings can be defined and locked within the application. The solution may also be extended to incorporate the specific needs of the organisation such as setting dial rules based upon dial prefixes and locations. In Call-back, user places a call through the application, which infroms the server of the destination number, which in turn calls the user back and bridges the destination number. Free for the user as the enterprise places both legs of the call. 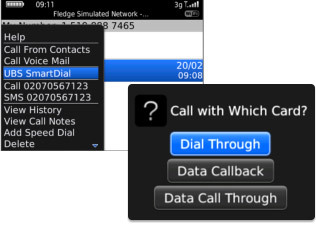 In Dial-Through, user places a call through the application, with no data signal a default service number is dialled by the client, on answer the client uses DTMF to pass the PIN and destination number for onward dialling, with data signal the call destination is setup on the server first, and routed automaticly once the service number is dialled by the application.